Tomahawk Vision SRT 2035 was revealed today in Auburn Hills. There will be three versions of the SRT Tomahawk Vision Gran Turismo, gained by completing online challenges. The entry level is the SRT Tomahawk Vision Gran Turismo S; then there is the GTS-R and the ultimate version X. All are badged for the 2035 model year. Active panels above the fenders move, via pneumatics, to create the optimal amount of downforce. An exposed aluminum spine channels air to help cool the V-10 engine. “Functional” NACA style air intakes on the front and large air intakes on the side are used for engine and brake cooling. A bold, carbon fiber graphic detail is prominent. Thin LED lights and five large exhaust ports are integrated in the rear diffuser. 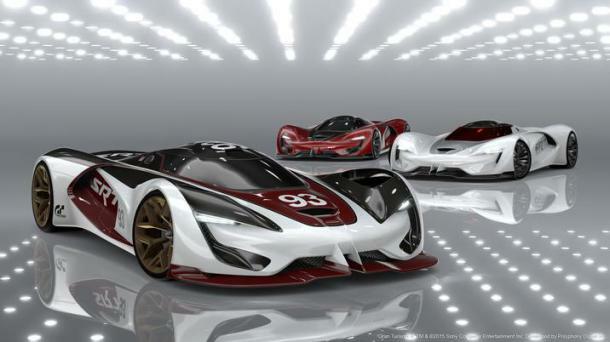 It goes without saying that the SRT Tomahawk Vision Gran Turismo will never see the light of day. However, gaming players will be able to download it and take it for a virtual spin in a couple of weeks. The GTS-R is powered by an evolution of the hybrid drivetrain that makes 1,450 horsepower by using a more powerful version of the V10. The GTS-R also benefits from a long list of weight-saving measures that allow it to hit a theoretical top speed of over 300 mph. Finally, the Tomahawk X turns the dial up to 11 with a 2,168-horsepower version of the V10. The drivetrain generates up to 2,590 horsepower, allowing the Tomahawk to reach a top speed of 404 mph.